Hormone Specialist Dr. Mark Richards says a recent study on the dangers of testosterone therapy uses statistical manipulation to skew the results. 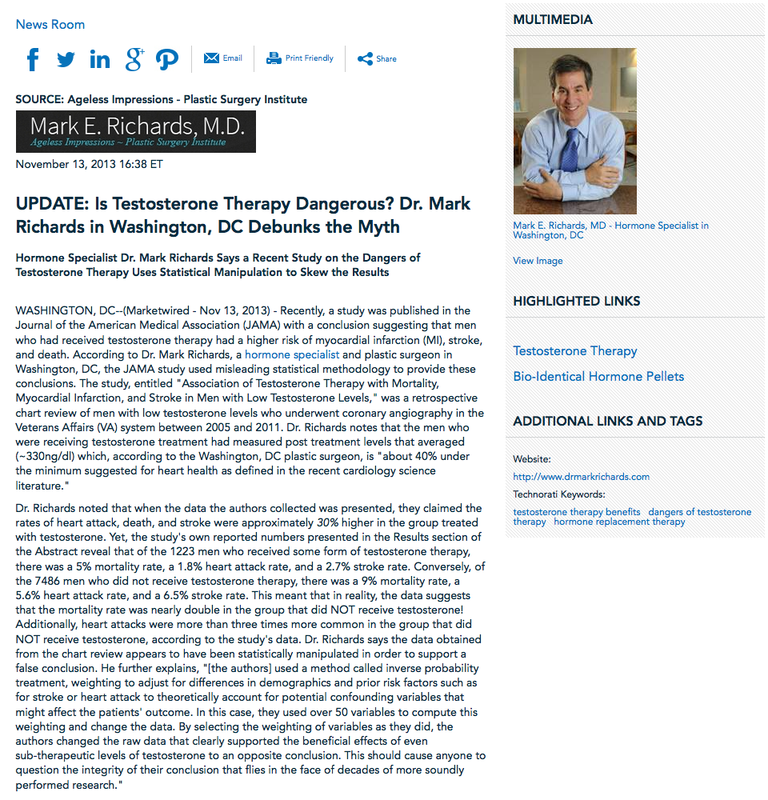 Arguing in support of the known benefits of testosterone therapy, Dr. Richards highlights some key information, noting that “decades of high quality prospective epidemiologic studies have shown a strong correlation between low testosterone levels in both sexes and disease and death rates. In particular, strong correlations exist between low testosterone and heart disease, diabetes/metabolic syndrome, breast and prostate cancers, atherosclerosis, depression, fatigue, loss of muscle mass, increased intra-abdominal fat, cognitive failures including Alzheimer’s disease, loss of mobility, loss of libido, decreased sexual function, and menopausal symptoms.” He stresses that many of these diseases have actually been prevented, improved, or cured with bio-identical human testosterone supplementation. Dr. Richards is concerned that the JAMA study’s conclusion will be misleading and confusing to physicians as well as the public, possibly resulting in the denial of treatment for those for whom this therapy might be lifesaving. Molecularly identical human testosterone modalities such as patches, injections, or gels, though not ideal, have been scientifically proven to be very helpful in treating disease states common in aging populations, he says. Dr. Richards believes the best hormone treatment uses highly compressed, sterile hormone pellets placed within the body’s superficial fat layers. He explains these pellets are placed while using local anesthesia, and dissolve completely, usually over a period of three to five months. He says this treatment has been used in the US since 1939, but because the testosterone pellets cannot be patented, they are not considered to be commercially profitable, and thus are not widely known or marketed. Dr. Mark Richards is a board-certified plastic surgeon in Washington, DC. He is also a practitioner in hormone therapy, using time-released bio-identical hormone pellets to improve effects of aging that cannot be treated with cosmetic surgery, such as energy levels and psychological and physiological health. Dr. Richards also offers his knowledge on the topic to assist physicians interested in offering hormone therapy to help their patients. He is available for interview upon request. To learn more about Dr. Mark Richards, his plastic surgery practice, or hormone therapy, please visit myhormonetherapy.com or drmarkrichards.com.